r.viewshed - Computes the viewshed of a point on an elevation raster map. Default format: NULL (invisible), vertical angle wrt viewpoint (visible). r.viewshed is a module that computes the viewshed of a point on a raster terrain. That is, given an elevation raster, and the location of an observer, it generates a raster output map showing which cells are visible from the given location. The algorithm underlying r.viewshed minimizes both the CPU operations and the transfer of data between main memory and disk; as a result r.viewshed runs fast on very large rasters. To run r.viewshed, the user must specify an input elevation map name, an output raster map name, and the location of the viewpoint. For the time being the viewpoint (coordinates parameter) is assumed to be located inside the terrain. The viewpoint location is given in map coordinates. The output raster map may have one of three possible formats, based on which flags are set. By default, if no flag is set, the output is in angle-mode, and each point in the output map is marked as NULL if the point is not visible or the respective point in the elevation map is NULL. Otherwise, a value in [0, 180] representing the vertical angle with regard to the viewpoint, in degrees, if the point is visible. A value of 0 is directly below the specified viewing position, 90 is due horizontal. The angle to the cell containing the viewing position is undefined and set to 180. 1 if the point is visible. the difference in elevation between the point and the viewpoint, if the point is visible. If you wish to identify the area of the map which is within the search radius but not visible, a combination of r.buffer and r.mapcalc can be used to create a negative of the viewshed map. By default the elevations are not adjusted for the curvature of the earth. The user can turn this on with flag -c.
By default the observer is assumed to have height 1.75 map units above the terrain. The user can change this using option observer_elevation. The value entered is in the same units as the elevation. By default the target is assumed to have height of 0 map units above the terrain. The user can change this using option target_elevation to determine if objects of a given height would be visible. The value entered is in the same units as the elevation. By default there is no restriction on the maximum distance to which the observer can see. The user can set a maximum distance of visibility using option max_distance. The value entered is in the same units as the cell size of the raster. Main memory usage: By default r.viewshed assumes it has 500MB of main memory, and sets up its internal data structures so that it does not require more than this amount of RAM. The user can set the amount of memory used by the program by setting the memory to the number of MB of memory they would like to be used. The algorithm can run in two modes: in internal memory, which means that it keeps all necessary data structures in memory during the computation. And in external memory, which means that the data structures are external, i.e. on disk. r.viewshed decides which mode to run in using the amount of main memory specified by the user. The internal mode is (much) faster than the external mode. Ideally, the user should specify on the command line the amount of physical memory that is free for the program to use. Underestimating the memory may result in r.viewshed running in external mode instead of internal, which is slower. Overestimating the amount of free memory may result in r.viewshed running in internal mode and using virtual memory, which is slower than the external mode. 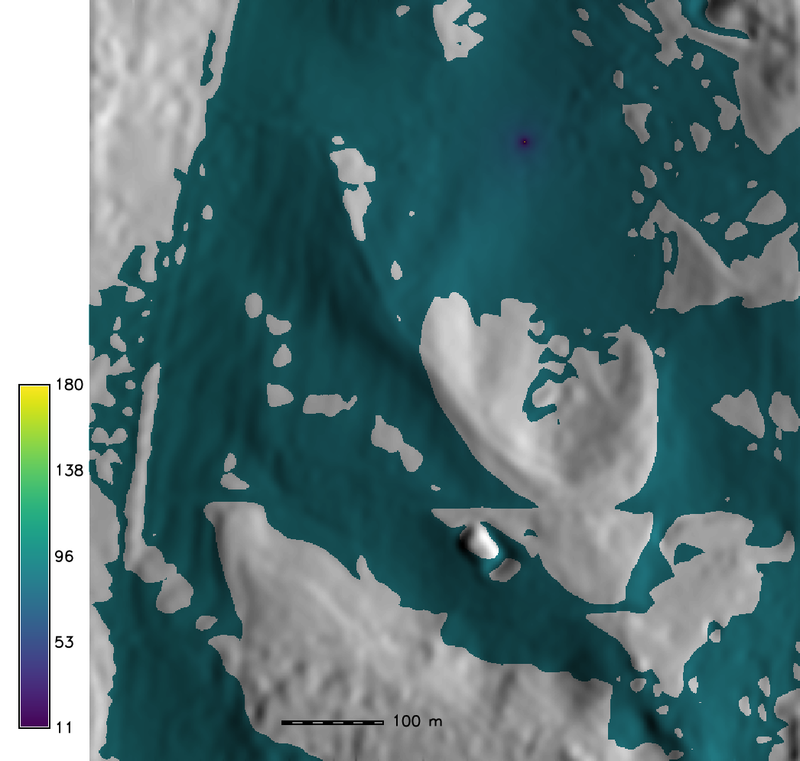 r.viewshed uses the following model for determining visibility: The height of a cell is assumed to be variable, and the actual height of a point falling into a cell, but not identical the cell center, is interpolated. Thus the terrain is viewed as a smooth surface. Two points are visible to each other if their line-of-sight does not intersect the terrain. The height for an arbitrary point x in the terrain is interpolated from the 4 surrounding neighbours. This means that this model does a bilinear interpolation of heights. This model is suitable for both low and high resolution rasters as well as terrain with flat and steep slopes. The core of the algorithm is determining, for each cell, the line-of-sight and its intersections with the cells in the terrain. 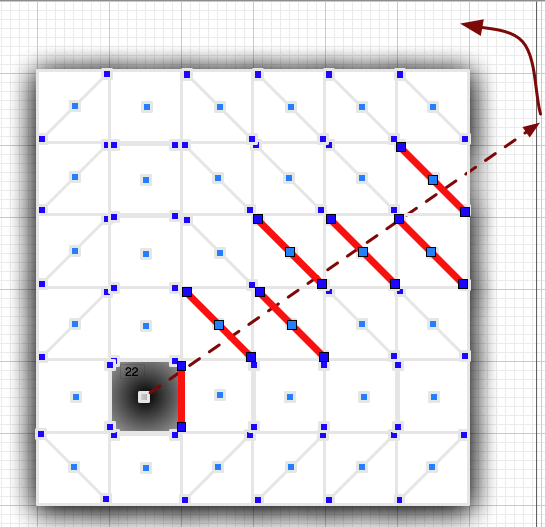 For a (square) grid of n cells, there can be O(n 1/2) cells that intersect the LOS. If we test every single such cell for every point in the grid, this adds up to O(n3/2) tests. We can do all these tests faster if we re-use information from one point to the next (two grid points that are close to each other will be intersected by a lot of the same points) and organize the computation differently. More precisely, the algorithm uses a technique called line sweeping: It considers a half-line centered at the viewpoint, and rotates it radially around the viewpoint, 360 degrees. During the sweep it keeps track of all the cells that intersect the sweep line at that time; These are called the active cells. A cell has 3 associated events: when it is first met by the sweep line and inserted into the active structure; when it is last met by the sweep line and deleted from the active structure; and when the sweep line passes over its centerpoint, at which time its visibility is determined. To determine the visibility of a cell all cells that intersect the line-of-sight must be active, so they are in the active structure. The algorithm looks at all the active cells that are between the point and the viewpoint, and finds the maximum gradient among these. If the cell's gradient is higher, it is marked as visible, whereas if it is lower, it is marked as invisible. 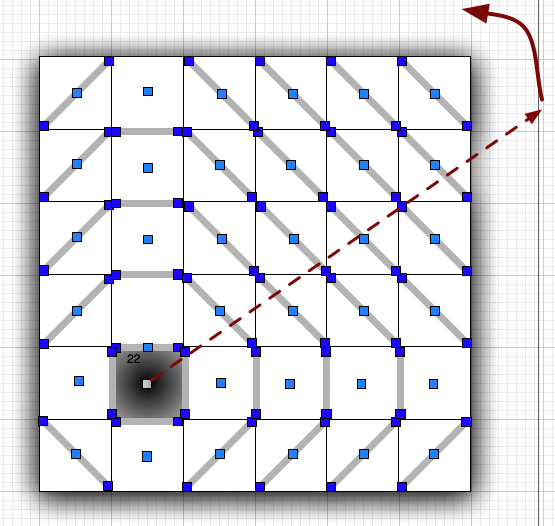 For a (square) raster of n point in total, the standard viewshed algorithm uses O(n sqrt(n))= O(n3/2) time, while the sweep-line algorithm uses O(n lg n) time. This algorithm is efficient in terms of CPU operations and can be also made efficient in terms of I/O-operations. For all details see the REFERENCES below. Computing Visibility on Terrains in External Memory. Herman Haverkort, Laura Toma and Yi Zhuang. In ACM Journal on Experimental Algorithmics (JEA) 13 (2009). Computing Visibility on Terrains in External Memory. Herman Haverkort, Laura Toma and Yi Zhuang. In the Proceedings of the 9th Workshop on Algorithm Engineering and Experiments / Workshop on Analytic Algorithms and Combinatorics (ALENEX/ANALCO 2007).